SOZO is a Greek word found in the Bible 110 times. 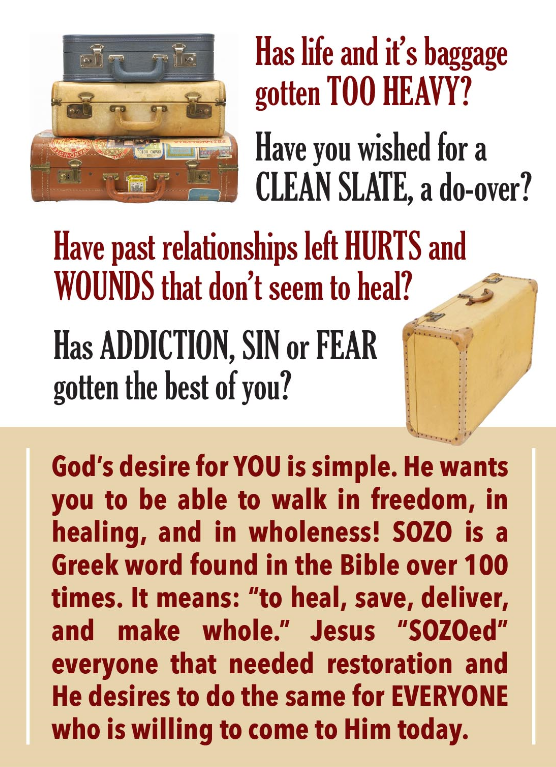 Jesus “SOZOed” everyone that needed restoration. Why do I need a SOZO? then SOZO ministry is for you. suffer from a traumatic loss. There are many reasons this ministry can be beneficial to your soul. What can I expect in a SOZO session? A SOZO session may typically last 1-2 hours. Conducted by a team member who has been trained and mentored to personally minister to you. Several phone calls or Skype interactions may be needed to complete the 1-2 hour appointment. SOZO is not a counselling session. It is a time for you to connect with Father God, Jesus and the Holy Spirit. Encountering the Godhead in this way reveals His great love, brings deep inner healing and allows you to experience wholeness. How often should I get a SOZO? Traditional (non-SOZO) counselling or inner healing ministry may take months or perhaps years to achieve a measure of healing. SOZO ministry goes to the root cause of your concern. This ministry reduces the long-term need for extended sessions and many times one or two sessions is all that is necessary. One of the goals of SOZO is to teach you how to use the “tools”, so that you can continue effectively discern any lies that you are believing as the Godhead directs your path. “Trust in the LORD with all your heart, and lean not on your own understanding; in all your ways acknowledge Him, and He shall direct your paths.” Proverbs 3: 5-6. How do I arrange for a SOZO appointment? We will send you an application for ministry and then set up a time for your personal SOZO appointment via telephone or Skype. What is the fee for SOZO? We appreciate financial gifts to enhance the TALL Truth Inc. Ministry and to bless the SOZO leaders. We ask that you would pray and ask God not what it costs, but what your SOZO experience is worth. Contact Shelly personally to request your SOZO! Ready to schedule your SOZO? Complete and return the attached application. God is so fun to give us immediate encouragement re: what we share! This Momma had the forgiveness prayer from yesterday’s talk and used it last night with her son – YAY GOD! YAY MOMMA! Your prayers ushered in the sweet Presence for women to receive Truth – it was a blessed time sharing the need for inner healing & forgiveness with hundreds of mothers/grandmothers – thank you and bless you! To God be the glory for the GREAT things He is doing! My 9 year old son deals with migraines and nightmares. I told him that on Friday we were going to discuss what I learned today, but with 10 minutes passing he was shaking with fear already in his bed. So we did a mini Sozo session tonight! The Holy Spirit revealed a family from 4 years ago that caused him pain and although he doesn’t give them much thought anymore, God told him to put that family into the prayer along with the pain and rejection he felt by them. I’m so proud of him for hearing the voice of the HS and speaking it out. He was hesitant at first, saying “well the names I heard were from when I was a kid.” (He’s only 9 now!! He’s still a kid! ) So I shared with him that most adults have people from 30 years earlier they have to forgive, so forgiving people from 4 years ago is better than waiting 30 years! !